It's Secret Recipe Club week again. You know the deal. Everyone picks a fellow member's blog. They pick a recipe (in secret) and everyone posts their blogs on the same day. It's a fun game, and everyone loves seeing someone else's take on their recipe. Today I opted to make her Fried Green Tomato BLT. Her BLT was stacked with aioli in between every layer like a real sandwich, but we opted for a composed salad for our dinner. It was delicious! My finance and I were both so happy with this. The aioli was luscious and the tart green tomatoes went perfectly with the salty bacon. Once you paired it with a slice of crusty bread, there was really nothing better. I changed a couple things about her recipe but not much. I made the aioli by hand instead of dirtying the food processor (the trick to aioli is confidence, nothing more). We didn't use the tomato coulis but it didn't seem to impact our salad. I also opted for arugula instead of bibb lettuce or field greens because I like the peppery taste and wilted arugula would actually be nice with the warm tomatoes. Other than that, the bones of this recipe are all Kate's and I hope you enjoy it as much as I did. Toss the garlic with a little olive oil and roast in a 300 degree oven until fragrant and soft. Mash with the back of your knife and finely chop. Put garlic, lemon, mustard and egg yolk in a coffee cup. SLOWLY pour in olive oil while vigorously whisking until the egg and oil emulsify. Season with salt and pepper to taste. Add a little more lemon if desired. Prepare three bowls/plates for dredging the tomatoes. In the first plate, pour all purpose flour with kosher salt and black pepper to season. In the second bowl, whisk the eggs and milk. In the third plate, use equal parts of whole wheat flour and cornmeal. Slice the tomatoes and dredge in the flour, eggs and cornmeal. Set aside until ready to fry. Heat a quarter to half inch of oil in a cast iron skillet on medium high. Place tomatoes in the oil and fry until golden brown on both sides. Toss the arugula with lemon juice, salt, pepper, crushed red pepper and a little Parmesan cheese. You can also add julienned, de-seeded tomatoes or shaved fennel to the salad if desired. Place aioli across the plate and lay the arugula perpendicular to the aoili. Lay the tomatoes on top of the arugula, saving some arugula to place in between the tomato slices. Top tomatoes with bacon and a little cheese before serving. Ooooh yummy. 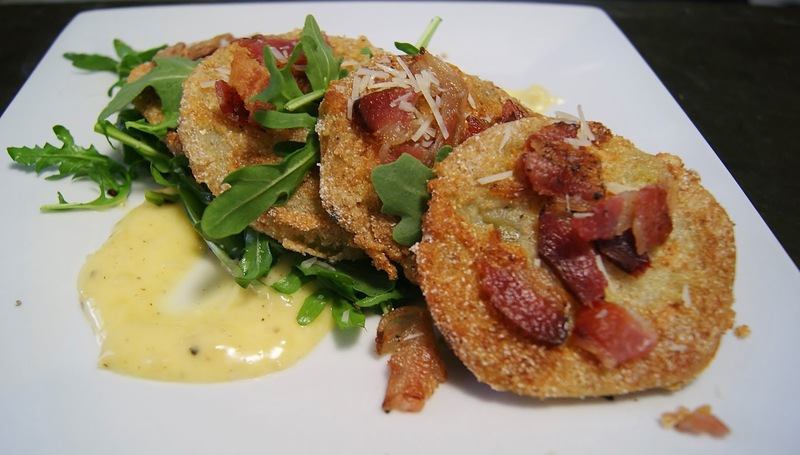 I've only had fried green tomatoes once, and they were pretty good, but I imagine homemade would be sooo much better. Adding ti to a BLT sandwich is genius! Looks delicious! I am anxiously awaiting my tomato plant, so I can make some fried green tomatoes too! Ohhh, I love that recipe! I'm so glad you enjoyed it as much as we did. Every time I head to the garden and look at my teeny, tiny green tomatoes I wish they'd grow faster so I could have this salad sooner! Kate rocks and this dish looks too delicious. I may have to sacrifice some green tomatoes! I love thiz recipe Stephy look amazing! I am not a fresh tomato fan so they are never in my salad. Wish I had thought of adding FRIED tomatoes. LOVE them. This is such a creative way to make a salad. Love fried green tomatoes! They look so tasty. Great SRC pick! We usually get so many green tomatoes in our garden in the summer and I'm always curious about what to do with that. This looks like a great option! Great SRC pick!